Acorns have served as a staple in the human diet for literally thousands of years, and there’s a good reason why. Each individual acorn comes jam-packed with calories (literally 100 calories per acorn), so you simply can’t ignore it as a potential source of food in a survival scenario. In fact, the acorn is probably one of the most overlooked survival foods in existence. It’s a food that you can stock up on at home, but it’s also a food that you can easily find out in the wilderness. In the fall, there are so many of them that in a few days, you could gather enough food to last for months! And in addition to being high in calories, acorns are very nutritious, containing lots of potassium, folate, manganese, vitamin B6, and other important nutrients. In this guide, we’ll talk about how to select acorns that are safe for consumption, the types of oak trees that produce acorns, how to prepare them for eating, and specific recipes that use acorns. What Makes Acorns One Of The Best Survival Foods? There are many reasons acorns are a great survival food, some of which we have already touched upon in the introduction. First and foremost, acorns are very plentiful across North America, and in virtually all geographical regions except for deserts and more arid areas. 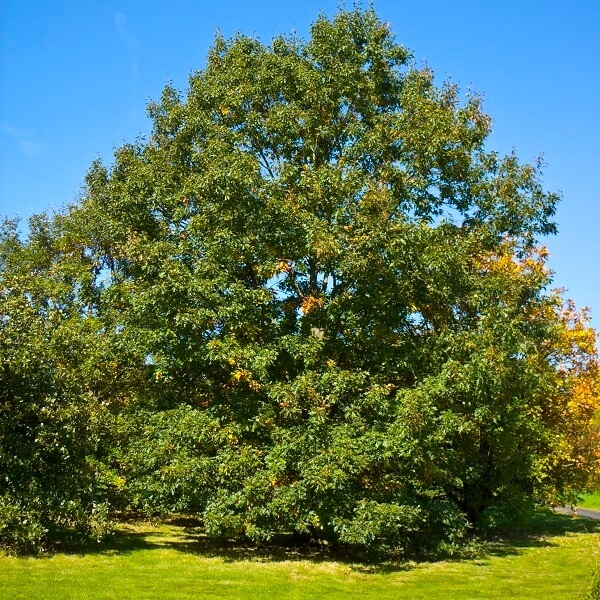 As long as you can find oak trees, you can find acorns, and they are particularly easy to harvest in the fall. 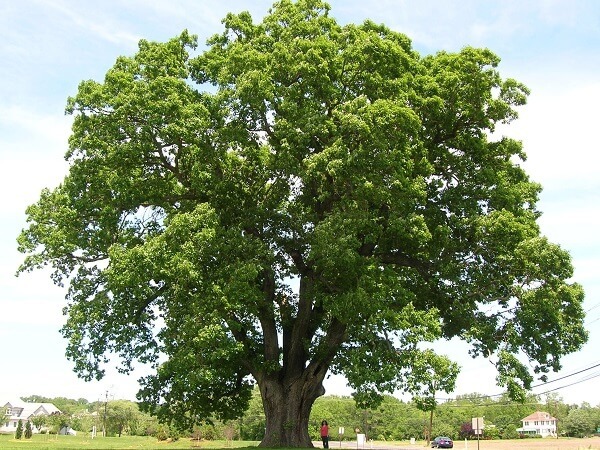 During late fall, usually September and October, all you have to do is shake the branches of an oak tree and several acorns will come loose and fall to the ground. Otherwise, you can pry the more difficult ones off yourself. Another reason why acorns are so valuable as a survival food is that they are incredibly easy to prepare for consumption and can be used in a number of different recipes. More on that later. And finally, the last major benefit that acorns have is that they are filled with calories, so they can give you a quick energy boost when you most need it. For this reason alone, they are highly valuable as a survival food. When you go to the produce section of the grocery store, you don’t just pick up the first fruits or vegetables you see, right? Rather, you inspect your options and try to pick out the best-looking ones. You’ll want to take the same approach when selecting acorns in the wilderness. Not all acorns are good to eat. Some may smell bad, be discolored, eaten through by bugs or worms–or worse, infected by fungus. This is non-negotiable because your health and possibly your life depends on it. Place all of your acorns in a bowl of water. Good acorns will sink, while bad ones will float. This tree produces bitter acorns with the poorest taste, but are still edible. This tree produces acorns with a much more mild taste. This tree produces acorns with a slightly more bitter taste though not as bad as black oak, and they require the most processing. This tree produces the best acorns for harvesting, and they lack the bitter taste of black and red oak. You can harvest and eat acorns from any one of the trees mentioned above. 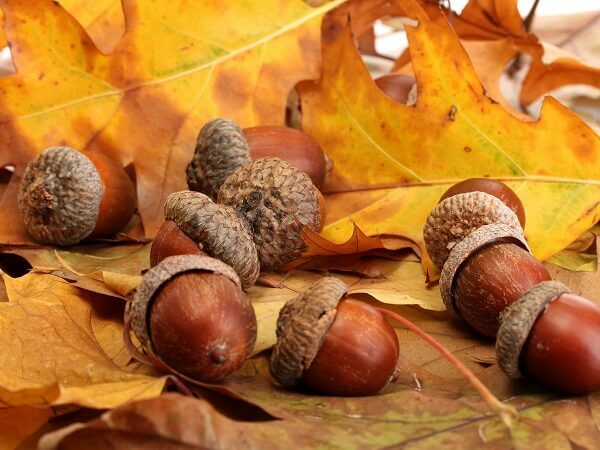 However, you still need to take steps to prepare the acorns for consumption, and you should also know that the more bitter an acorn is, the more processing time it will require. And remember, when choosing acorns for consumption, make sure that they lack any of the negative defects we outlined above. Otherwise, they simply won’t be safe to eat. Once you have your acorns selected, you can follow these steps to prepare them for consumption. This step isn’t required, but it will make shelling the acorns a lot easier. Place them in an oven for at least fifteen minutes and at a temperature of 150 degrees F; if you are in the wilderness, you may want to build a stove oven. Another option is to set the acorns out in the sun for several weeks; just make sure to cover or move them if it rains. You could also use a food dehydrator. NOTE: Acorns from red oak trees will need to be boiled before they are shelled because otherwise, the skin is very difficult to remove. The best way to do this is with a nutcracker, but if you don’t have one, you can just hit them with a rock. Just be careful to only crack the shells and not completely smash them. As you’re shelling the acorns, if you notice the inside looks moldy or has larvae, discard it. The inside should look tan or brown, sometimes with spots. This step is optional, but I recommend doing it because it will make the acorns tastier and make the flour smoother. The inside of the acorn is covered with a papery skin. All you have to do is remove the skin with your fingers. You can also stir them up thoroughly and let the wind blow away the skins. This step is also optional. It depends on whether you want to eat the acorn nuts whole. However, I don’t recommend it because they can be difficult for some people to digest, especially with all the tannins (see the next step). To grind them up, you can use a mortar and pestle or a powerful blender. If you plan on making flour, this is not the step to do it. For now, just grind them up into small chunks. Next, you will need to work on removing the tannins in acorns, which is what causes them to taste bitter. Put the ground up acorns into a jar. Put on a lid and shake the jar thoroughly. Put them in the fridge for 24 hours. Drain out the water and repeat the first three steps. Do this until the acorns are no longer bitter. Note: This step isn’t necessary if you’re fine with the bitter taste. Teas, for example, include tannins and are vitally necessary to their unique taste. In fact, you may even prefer the taste of the tannins in your acorns, so it’s entirely up to you if you want to follow the above process. At this point, the only thing left to do is to dry out the acorns (or acorn meal). You can let them air dry, you can put them in a food dehydrator, or you can put them in the oven at 150 degrees F (which is what I do). Run your acorns through a food processor or blender. Place the resulting meal in an oven and dry them out on a low heat for a few minutes. Alternatively, you can air dry, but this will take several hours. Proceed to grind the acorns again into a more fine flour. This is the flour that you can use to make virtually anything you can make with normal flour, including bread and cookies. Once you have your acorn flour, you can keep it in the fridge, but only if you plan on using it all within a couple of weeks. Acorn flour has lots of oils in it and will go rancid before long. To store it for a long time, keep it in the freezer for up to two years. Now that you have your acorn flour, it’s time to try some acorn recipes. Place the chunks of acorns on a baking sheet. Sprinkle the acorns with salt and anything else that you want to improve the flavor. Toast the acorns for 15 minutes at 375 degrees F.
Alternatively, you can place them in a pan and then roll them around over a campfire. Once the acorns have a brownish color and a roasted smell to them, they are ready to eat, and you can eat them as you would normal peanuts. In a survival situation, this is by far the easiest way to prepare your acorns. Okay, maybe this isn’t true coffee because caffeine is not an ingredient present in acorns. But still, it will be better than nothing. Place the chunks of acorns on a cooking sheet. Roast them for 30 minutes at 150 degrees F.
If they’re still moist, it may take up to 45 minutes or more. 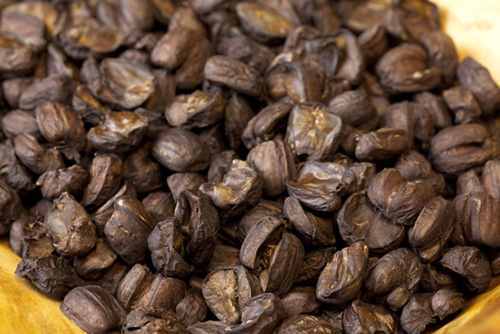 Once the pieces have a roasted smell and a dark brown color, they will be ready to eat. Add a tablespoon of acorn into a cup of boiling water. Steep it for at least ten minutes, and then add any other additives that you want. At this point, you’re all set to drink your acorn coffee. Mix the baking soda, salt, and acorn flour together in a bowl. In a separate bowl, whisk the butter and then add the sugar and vanilla, and continue to mix together well. Add the eggs, and continue to mix thoroughly. Mix the two mixtures together and whisk them together thoroughly. This will create a dough, that you can then divide and roll into whatever shape you want your cookies to be. Lay out your cookie rolls onto a baking pan, and then put them in the oven at 375 degrees F.
Wait for ten minutes, and then remove them from the oven. They should be a golden brown color, and they’ll be ready to eat. NOTE: With the above ingredients, you should be able to make at least four dozen cookies. Here are some other acorn recipes to try. The purpose of this article has been to show you how valuable acorns can be in a survival scenario, or even just in your everyday life. Based on the information in this article, you now know what makes acorns a great survival food, how to choose acorns that are safe for consumption, how to prepare acorns for eating, and how to use them in various recipes. This isn’t to say that acorns are the only valuable survival food out there, but they are one of the best. In Texas, we have live oak trees. Are these acorns good to eat?